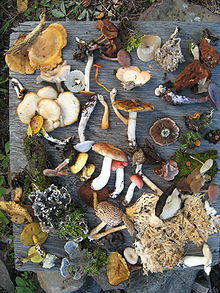 Biodiversity, a contraction of "biological diversity," generally refers to the variety and variability of life on Earth. One of the most widely used definitions defines it in terms of the variability within species, between species and between ecosystems. It is a measure of the variety of organisms present in different ecosystems. This can refer to genetic variation, ecosystem variation, or species variation within an area, biome, or planet. Terrestrial biodiversity tends to be greater near the equator, which seems to be the result of the warm climate and high primary productivity. Biodiversity is not distributed evenly on Earth. It is richest in the tropics. Marine biodiversity tends to be highest along coasts in the Western Pacific, where sea surface temperature is highest and in the mid-latitudinal band in all oceans. There are latitudinal gradients in species diversity. Biodiversity generally tends to cluster in hotspots, and has been increasing through time, but will be likely to slow in the future.